Back in the Bronx, the big guys delivered. Todd Frazier hit a go-ahead, three-run homer into the short porch in right field in the second inning against Charlie Morton. 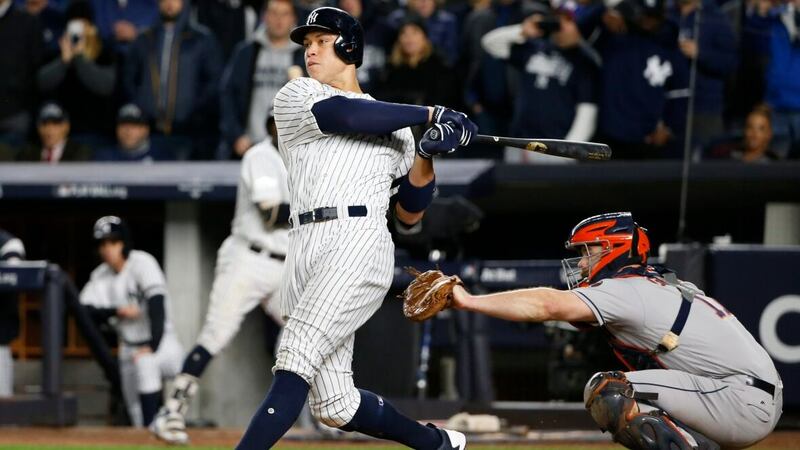 The 6-foot-7 Judge entered in a 4-for-31 (.129) post-season slump that included one home run, four RBIs and 19 strikeouts. The slugger capped a five-run fourth with a laser of a drive to left field off Will Harris and robbed Yuli Gurriel and Cameron Maybin of extra-base hits. Sabathia, almost as big at 6-foot-6, allowed three hits over six scoreless innings for his first post-season win in five years. The Yankees stopped a seven-game ALCS losing streak dating to Sabathia’s victory over Texas in 2010 — when Judge had just started his freshman year at Fresno State. After a pair of 2-1 losses in Houston, the Yankees led 8-0 after four innings. New York improved to 4-0 at home this post-season. The Yankees were an AL-best 51-30 at home this season. “We’re somewhat built for this ballpark,” manager Joe Girardi said. Houston scored on a bases-loaded walk in the ninth before post-season star Jose Altuve grounded into a game-ending double play with the bases loaded. Frazier got the Yankees rolling, taking an awkward hack at a low, outside fastball and slicing an opposite-field drive over the right-field scoreboard. “You don’t think it’s going, just because how unorthodox the swing was,” Frazier said. Judge used his height and long left arm to make a leaping catch with his left shoulder slamming into the right-field wall against Gurriel starting the fourth. Then in the fifth, he sprinted into short right for a diving backhand catch on Maybin. On the first chilly night of the autumn with a game-time temperature of about 14 C, Sabathia relied on the sharp, slow slider that has helped revive the former flamethrower’s career. Pitching with caution to Houston’s dangerous lineup, he walked four, struck out five and pitched shutout ball for the first time in 21 career post-season starts. During the regular season, he was 9-0 in 10 starts following Yankees’ losses. “It’s weird, me being 37, smoke and mirrors, getting a shutout,” Sabathia said. Adam Warren followed with two hitless innings, Dellin Betances walked his only two batters and Tommy Kahnle finished. Houston had four hits, leaving it with just 15 over the first three games, and is batting .169 in the matchup. Morton was chased after 3 2/3 innings and allowed seven runs and six hits: three infield singles, a bloop single to centre, a double that Maybin allowed to fall in left and Frazier’s homer. A New Jersey native who grew up a Yankees fan, Frazier entered 7 for 18 against Morton with two home runs. With Frank Sinatra’s version of “Fly Me to the Moon” as his walk-up music, Frazier hit not-quite a moonshot, driving a pitch just 18 1/2 inches above the dirt 365 feet with pretty much just his left arm. That gave the Yankees their first lead of the series. Frazier motioned to his family in the stands and looked at his left wrist. “I’m pointing to them and saying: What time is it? It’s my time,” he said. Houston loaded the bases with two outs in the third on a pair of two-out walks around Alex Bregman’s single. But Carlos Correa popped out on a fastball in on his fists. Sabathia raised both arms and pointed toward Judge after his catch in the fourth. New York broke open the game in the bottom half. Chase Headley hit a run-scoring infield single — ending an 0-for-28 slide by New York designated hitters in the post-season. Brett Gardner was hit on a leg by a pitch, loading the bases, and Harris came in and threw a wild pitch that allowed Frazier to come home from third. Altuve made two fine stops on Did Gregorius, first a backhand stop on his third-inning grounder and then a shuffle pass to Harris covering first for the final out of the fourth after a hard grounder off first baseman Marwin Gonzalez’s glove. Girardi, booed by fans after failing to call for a replay in Game 2 of the Division Series, was cheered when introduced. RHP Luis Severino is on track to pitch a Game 6 for the Yankees. He was removed after four innings and 62 pitches in Game 2 because Girardi felt he was “underneath” the ball. Girardi said Severino did not need any tests and is OK.
“I asked him if he still hated me, and he said, ‘no,”‘ Girardi added.